Difference between revisions of "Yukidarumon"
|desc=Punches with a freezing cold fist. 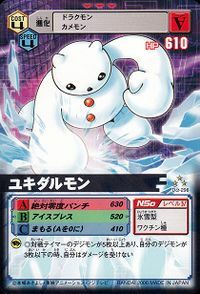 An Ice-snow Digimon whose body is covered in ice and snow crystals. Behind its cold appearance lies a warm-hearted, gentle personality. Yukidarumon dislikes fighting, and its sweet behavior warms the hearts of those who watch it in action. 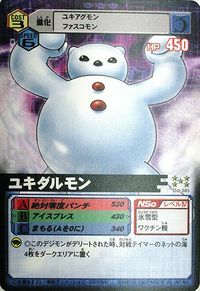 While it is ill-suited to fight against battle-loving Digimon, it is especially outmatched against Meramon. 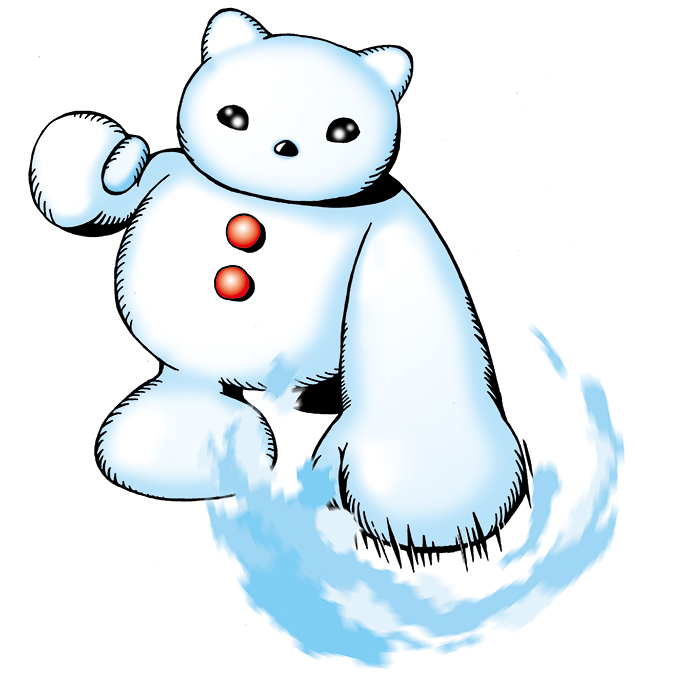 Its Special Move is Zettai Reido Punch, which it fires from its large body. — Digimon Adventure: "Clash! The Freezing Digimon"
— Digimon Adventure 02: "Destroy the Dark Tower"
— Digimon Savers: "The Heartless Past Revealed! Gizmon: AT"
n., From Yukidaruma 「雪だるま（ユキダルマ）」, which means "snowman". adj., From Frigid, meaning cold. Anime/Manga Digimon Adventure: "Clash! 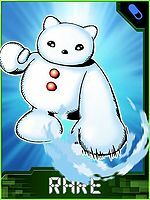 The Freezing Digimon"
Zettai Reido Punch  Absolute Zero Punch 絶対零度パンチ Zettai Reido Panchi Sub-zero Ice Punch/Subzero Ice Punch/Absolute Zero Ice Punch Punches with a freezing cold fist. アイスブレス Aisu Buresu Icy Breath Breathes out cold air. 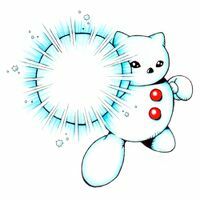 Yukigassen  Snowball Fight 雪合戦 N/A Snow Ball/Snowball Throws a barrage of snowballs. 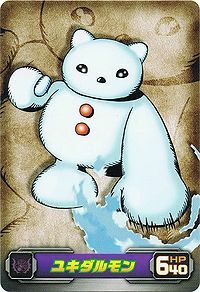 Yukidarumon is one of the Digimon on File Island. He fell under the control of one of Devimon's Black Gears that embedded itself in his back. He unwillingly battled Taichi and Agumon until Taichi kicked Agumon under Yukidarumon so he could destroy the Black Gear on his back, a move Taichi called "Ace Striker Miracle Kick", freeing Yukidarumon from the Black Gear's control. Yukidarumon thanked Taichi and told him that he had seen another kid (Yamato) and a Gabumon on another island. Created an ice bridge to aid Taichi and Agumon in reaching the island. When they arrive Yukidarumon suggests they start their search in the forest where they find Yamato and Gabumon. They discover that Gabumon had caught a cold so Yukidarumon left to look for herbs and grass to cure it. He found them but was rejoined with them sooner then he had expected when they fell off of a cliff, as a result of Taichi and Yamato fighting each other then being attacked by Mojyamon under the control of a Black Gear, and landed on him. Yukidarumon gave them the herbs and grass. Mojyamon lept off of the hill after them and Yukidarumon interviened knocking Mojyamon against the cliff but Mojyamon recovered and charged him again. Yukidarumon threw an Zettai Reido Punch at him but Mojyamon avioded it and grabed Yukidarumon by the arm and threw him followed by attacking with his Bone Bone Boomerang but Yukidarumon, as well as Taichi and Yamato ducked narrowly avoiding it. Taichi and Yamato evolved Agumon and Gabumon into Greymon and Garurumon. Mojyamon attacked again with his Hone Hone Boomerang but Garurumon caught it in his mouth and crushed it. Greymon attacked with Mega Flame but Mojyamon jumped out of the way and kicked Greymon off of his feet. Yukidarumon grabbed Mojyamon from behind holding him in place so Greymon could use his Mega Flame again to destroy the Black Gear freeing Mojyamon. 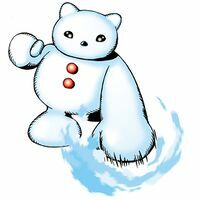 Yukidarumon was among the Digimon who helped build a raft for the Chosen Children after the defeat of Devimon and among the Digimon who aided the Chosen Children in fighting Piemon's Evilmon. Ken, as the Digimon Kaiser, took control of several Yukidarumon using Evil Rings and used them to defend a Dark Tower in an artic regin. However, having build a snow sled the younger Chosen Children and Jou were able to move fast enough that the Yukidarumon's reflexes were to slow to hit them allowing them to destroy the Dark Tower while V-mon distracted them by evolving into Fladramon. A Yukidarumon is the partner of the Amercian chosen child Steve. Some Yukidarumon were seen at the Akiba Market and the Trailmon Race. 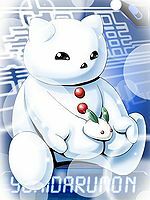 A kindly Yukidarumon found Ikuto in the snow as a baby and adopted him as her own. She was killed by one of Kurata's Gizmon, causing Ikuto to hate humans. 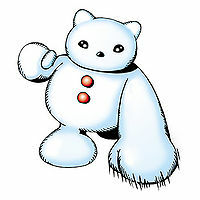 Yukidarumon appears as an obtainable Adult-level Data type Digimon in Digimon World. 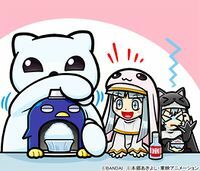 If you bring a Digimon that hates the cold, such as a Baby I and a Baby II leveled Digimon, or a Digimon that has the "Fire" or "Earth" type, such as an Agumon, Greymon, Meramon, Kunemon, Palmon, Kabuterimon, etc to Freezeland and it gets sick, it will faint along with the Player. 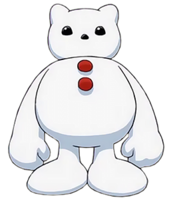 The Player will then wake up inside Yukidarumon's igloo, who has saved the Player and its Digimon, then scolds the Player for its impertinence and won't join the Village of Beginnings until the Player brings a Digimon that resists the cold. If done so, Yukidarumon will join the Village in the Restaurant along with Meramon, Tyranomon, Garurumon, Vademon and Digitamamon. If none of the aforementioned Digimon was recruited, Yukidarumon will build the Restaurant. An easier way to sicken the Digimon is to bring a Moldy Meat that can be obtained by an vending machine in the Ancient Dino Region and feed it to the Digimon. 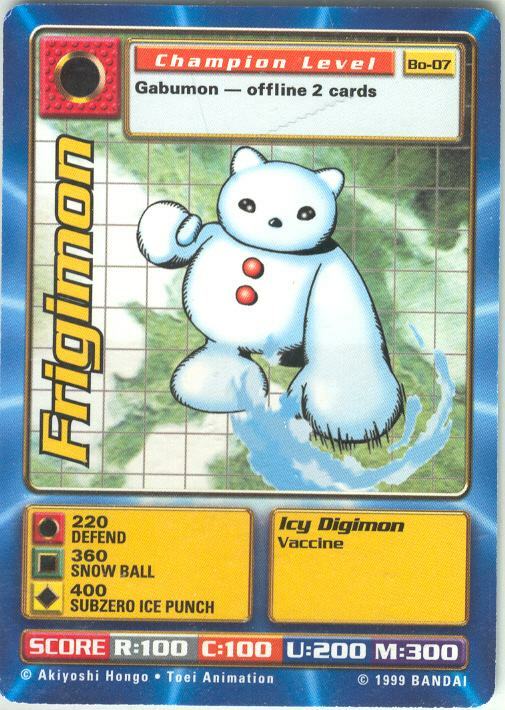 Yukidarumon's Digivolution item is the Ice Crystal which lets any Child Digimon evolve into Yukidarumon. 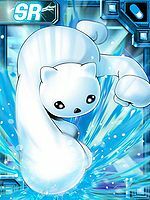 Yukidarumon is an obtainable enemy Digimon. 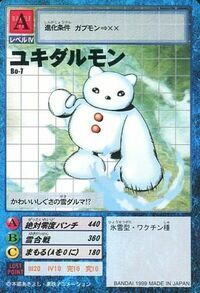 Evolves from Yuki Agumon (0-2 DP) and can evolve to Monzaemon (0+ DP). 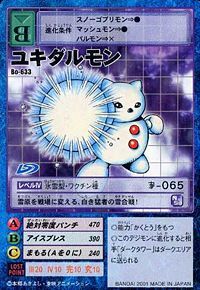 Yukidarumon appears as an opponent and an obtainable Blue Card. Can be obtained either by evolving or converting scan data. Evolves from Gabumon or Elecmon. Can evolve to Metal Mamemon. 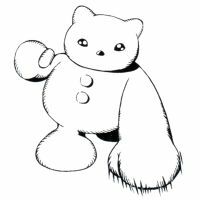 Yukidarumon can be obtained by entering the password "ナカミハアッタカ○ユキダルモン○○○○○○○○○". 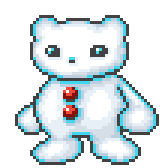 This white stalwart's snowball fight changes the snowfield into a battlefield!